How “green” is Electric Vehicle Driving? At first, my heart sank. If we were going to suffer through some of the inconveniences of driving electric in a nation filled with gas-fueled vehicles, than at least I wanted to feel smug about the fact that we were doing our part to reduce our carbon footprint. Then, I wrote back to the reader, and asked him to back up his statement, or at least lead me to some references. He responded, and what the reader discovered even surprised him. The percentage of electricity produced by coal plants in California was less than he expected. However, coal is still a player in California, as discussed in this story by KQED, which explains that how much coal-fired power goes into your grid depends alot on where you live in the state. The reader turned me on to this website which breaks down how California utilities generate their power. 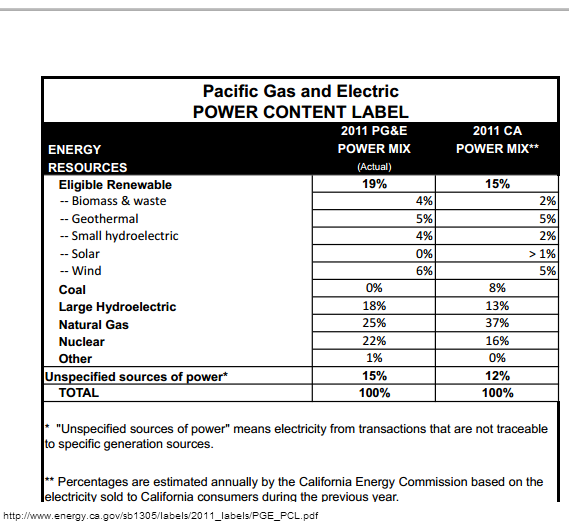 In California, every retail electricity supplier must disclose the sources of their electric generation in what is called a “Power Content Label.” The reader sent me the label for Silicon Valley Power, which in 2011 (the most recent I could find) received 12.9 percent of its electricity from coal-fired plants, an increase from 2010, and higher than the 2011 rate in California overall at 8 percent. Its renewable sources such as solar, wind, geothermal and small hydro electric facilities totaled 25.1 percent, significantly higher than California’s total in that category at 15 percent. In checking the utility that supplies us with electricity – Pacific, Gas & Electric – I found that the power label said that it used no coal-powered plants in 2011. Its renewable sources were 19 percent. Other sources included: nuclear; 22 percent; natural gas, 25 percent; large hydro, 18 percent. So is driving electric more green? I think so, but I have a feeling this will not be the last blog post I will do on this subject. Clean Tech blog tackled the question last year and received plenty of comments from all corners. What I do know for certain is that my husband drove 1,400 miles in January without his car consuming a single drop of gasoline. 1. Even if the electricity used is produced entirely by coal, electric vehicles produce less CO2 per mile than equal-sized (weight) petroleum-fueled vehicles. 2. Only 44% of US electricity is currently produced by coal and the grid will only get “cleaner” moving forward. And therefore, EVs pollute LESS as they age, rather than MORE in the case of most “ICE” vehicles. 3. If one wishes to avoid ANY burning of fossil fuel, they can install solar panels to produce all the fuel their vehicle requires. Doing this, the car and the panels help pay for each other, in a sense. And finally, note a non-environmental benefit of ALL methods of electric generation: they are all *domestic*, which means that all money spent to fuel EVs stays in the country, and thus does not add to the trade deficit (or worse). The Electric Power Research Institute (epri.com, based in Palo Alto) is a good resource to verify this information or continue research. Bottom line and in answer to this post’s question: Along with other benefits, Electricity is quite green (already “greener” than petroleum) and will only get greener. « Last call for free home electric car chargers!